As each guest arrives, give them an enchanting witch hat filled to the brim with yummy treats! 1. Begin by printing your free template out and cutting out the witch hat elements. Attach them to your chosen First Edition Textured card sheet with Washi tape. Cut each piece out. TIP: Ensure that you cut the band that will be used to wrap around the witch hat, in an alternative colour. 2. Use a craft knife to cut the aperture from the circular base. 3. Cut out the witch buckle template onto a piece of Dovecraft gold mirror card. Use a craft knife to cut out the small aperture. 4. Adhere a line of Dovecraft Perma Fix tape to one side of the cone shape. 5. Wrap your cone to make the main section of your witch hat. 6. Use Dovecraft glue to attach your witch hat to the circular base. Leave to dry. 7. Add Dovecraft Perma Fix tape to the edge of the band that will go around the witch hat. Wrap it around the bottom of your hat design, ensuring that it’s secure. 8. To finish, glue your gold buckle to the front of your witch hat! 9. Now your witch hat is ready to be filled with trick or treats. You could create a variety of witches’ hats in different colours! To create the vampire lips prop, cut out the lips design from your free template on to a sheet of Dovecraft black glitter card. Use the lips template on an alternative Dovecraft glitter card colour but this time, cut out the aperture. Cut out the fang template onto Dovecraft white glitter card, cut out and adhere to the back of the coloured lips. With Dovecraft Perma Fix tape, adhere your coloured lips to the black lip shape. Adhere a long cocktail stick to the back so your guests can turn into blood sucking creatures of the night! Give your candles an eerie edge with the Dovecraft red Enamel Effects glue! Squeeze a large amount of red Enamel Effects glue 5cm from the top and drag it vertically to the top of the candle. Repeat this around the candle, ensuring to vary the design to create the dripping effect. Make sure the top edge of the candle is completely covered*. *Do NOT burn the candles decorated with Enamel Effects glue, this is just for decoration. 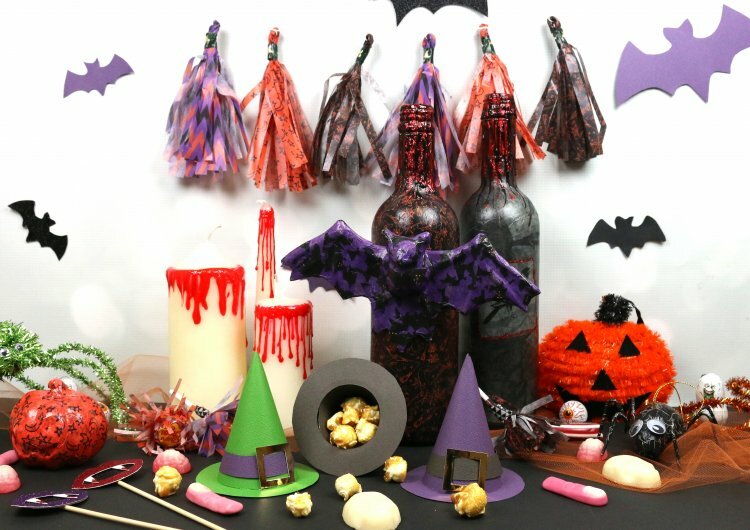 Transform your old wine bottles into creepy centre pieces using the Simply Creative papers. Clean your bottles, cut small squares of decoupage paper and layer it on to your bottle with First Edition Deco Mache adhesive and gloss and a First Edition bristle brush. Drag lines of Dovecraft red Enamel glue and glitter glue from the top of the bottle down a 1/3 of the way to add interest. Hobbycraft sell a selection of Mache Halloween shapes that can be covered with spooky Simply Creative papers. Maxine has added a decoupage bat to the centre of one wine bottle to add interest! We have also added googly eyes to the decoupage spider for fun! To create your frilled bunting, fold a piece of Simply Creative decoupage paper in half and cut a fringe along the non-folded edge. Open it up and roll your paper ensuring the fringe is both at the top and the bottom. Fold your roll in half, twist the top ensuring to leave a space to loop twine through and secure it with a piece of Dovecraft Washi Tape. Create as many as you like a thread a length of twine through the loop at the top of each piece to create the bunting. To create broomstick lolly pops, use a ¼ of a Simply Creative Decoupage sheet, create a fringed effect along one edge and stick it with Dovecraft Perma Fix tape around your lolly pop. Add a strip of Dovecraft Washi Tape to the top to secure. Your free template also includes a bat design that could be cut out on different coloured card to stick around your home! This collection of creepy projects won’t take you long to whip together and will definitely give your house the spooky edge you’re looking for. We can’t wait to see your Halloween party decorations so remember to upload them to the project gallery and when uploading to social media, to #trimcraft.